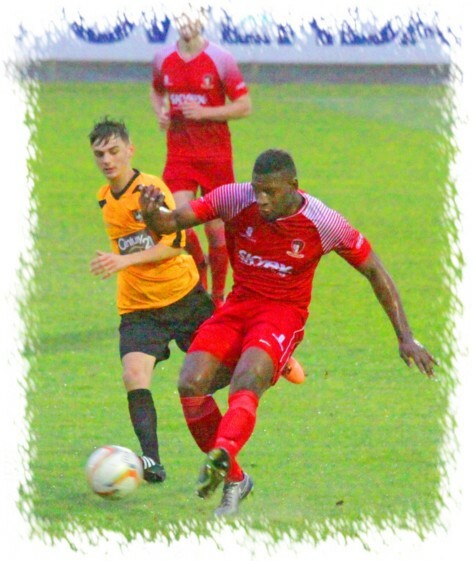 On a soaking wet afternoon at the SKYex Community Stadium, Hayes and Yeading United maintained their fine recent form with a comfortable 4-0 victory over Aylesbury United, to put pressure on their rivals at the top of the EvoStik League Southern East Division table. As early as the third minute, Manny Duku had a shot from Toby Little’s dangerous cross deflected just over the bar and from the resulting Scott Donnelly corner, Spyros Mentis put a near post header just wide. Duncan Culley then had a close range header from another pinpoint Little cross well blocked by Aylesbury United keeper, Jack Sillitoe. The visitors had their first real foray into the Hayes and Yeading half soon afterwards but from a swift counterattack, they found themselves under severe pressure from Culley’s powerful run and the forward was brought down by Alex Collard for a penalty which he put away himself, sending Sillitoe the wrong way. Xavi Comas, making his first league start for Paul Hughes’s side between the sticks was called upon to save two shots in quick succession, first from marauding midfielder Ben Seaton and then from former Hayes and Yeading striker Tre Mitford, but he was not unduly troubled by either. His counterpart Sillitoe made his own comfortable save from Donnelly’s thirty yard free kick and Duku was denied by his block having turned and latched onto Donnelly’s cleverly dinked throughball. On 32 minutes, the home side added a second through top scorer, Duku who capitalised on a slip by Jack Wood in challenging for a long ball and with the referee playing advantage after Wood tried in vain to bring him down, the Dutch striker cut inside from the left channel and tucked the ball into the far bottom corner. The Ducks then enjoyed their best spell of the game and four minutes before the break, Seaton’s deflected shot was acrobatically tipped over the bar by Comas just as it threatened to dip in. Aside from this scare, the home side were able to hold any prospect of a comeback before half time at arms length quite comfortably. For Aylesbury United, a Mitford shot was well saved by Comas at the start of the second half. However, the hosts took back the momentum and almost added to their lead by taking advantage of a dropped catching attempt by Sillitoe who reacted bravely by blocking the close range effort of Mentis who had pounced on the loose ball in the six yard box. The visiting keeper showed much better handling to produce a highly impressive diving catch to keep out Joyce-Dwarika’s rising curler from 20 yards. However, he was powerless to stop Culley’s second goal of the game, a low 15 yarder taken early which was in the back of the net before the keeper had time to adjust. Both Mitford and Ollie Hogg were just off target as the visitors kept their efforts up despite the three goal deficit. However, superior finishing was to prove decisive again as Donnelly seized on a loose pass out of the Ducks’ defence and advanced before planting his shot into the bottom corner, a shot that Sillitoe would be disappointed to have let through under his dive. This proved to be the killer blow and the home side finished the game well in control and even created further half chances to extend the lead which were not taken. In stoppage time, Comas preserved his clean sheet with a save low to his left from substitute Tyriq Hunte, allowing Hayes and Yeading United to celebrate a fully satisfying win.